Summer is now upon us. It might be very tempting to frolic under the sun too much but don't you ever forget to bring and religiously apply sunscreen regularly. Mind you, sunscreen should be your all-year round buddy! 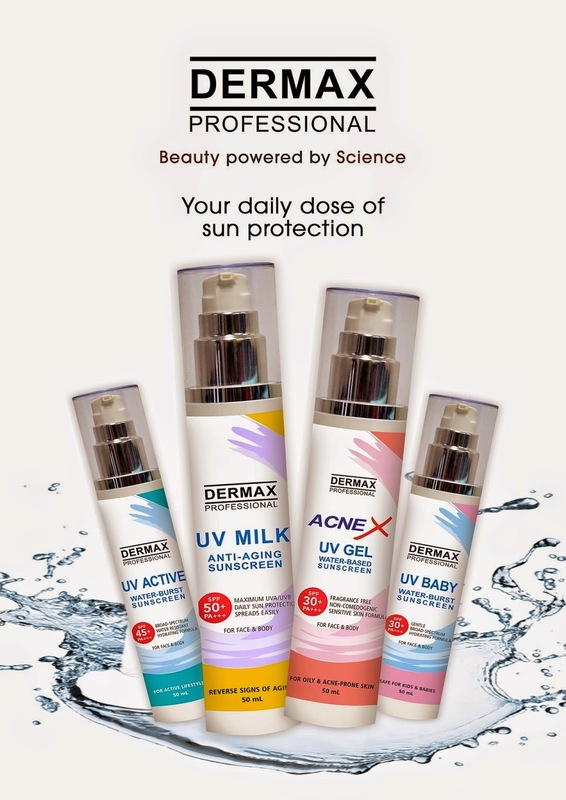 To give you superb protection DERMAX Professional offers a sunscreen line specifically formulated for all skin types. UV Milk Anti-Aging Sunscreen SPF 50 PA ++ has milky touch formula and provides maximum UVA/UVB daily sun protection while UV Gel Water-Based Sunscreen SPF 30+ PA++ provides sun protection for oily, acne-prone and sensitive skin. This is fragrance-free and non-comedogenic. And there's the first of its kind, the sunscreen with "water-burst"technology where it is applied as lotion but will leave a cooling burst of moisture making your skin feeling fresh and moisturized. These are: UV Baby Water-Burst Sunscreen SPF 30+ PA++ that offers broad spectrum sun protection and is safe for kids and babies 6 months and older, and UV Active Water-Burst Sunscreen SPF 45+ PA +++ which is a water resistant sunscreen perfect for those with active lifestyles. DERMAX Laser Center also offers specialized treatments such as the sought after Gold standard Diode laser hair removal service. This gives you hair-free skin at a pain-free procedure.Then there's Axilight Laser to visibly lighten your underarms giving you the freedom to flaunt your pits as you sashay around on your swimwear. PROMO ALERT!! 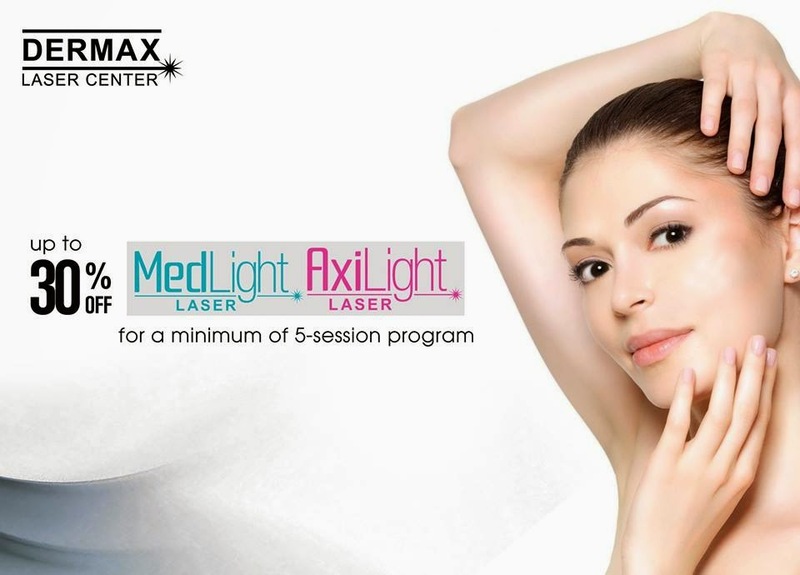 Get up to 30% OFF on MedLight and AxiLight Laser for a minimum of 5-session-program. Promo is until March 22, 2015 only. To know more about DERMAX Laser Center and DERMAX Professional products, visit their branches at the level 3, Abreeza Mall, Davao City with telephone number 0942-344-6954; and at Level 3, Centrio Mall Cagayan de Oro City. Nice. Is it available in Manila? In Manila, you may try going to their sister company, Skin Station. It looks like a good product. I can't try it though since I already have a derma that takes good care of my skin. However, I'm sure that this is something others can give a shot.